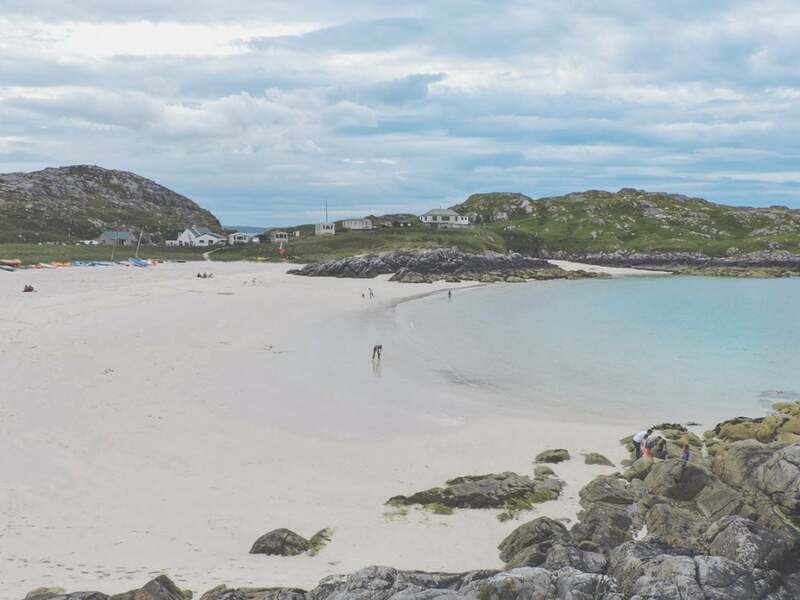 White sand beaches and blue turquoise water in – Scotland? That can’t be right! You bet your bottom it is. These are the kinds of sights that you can see along Scotland’s North Coast 500 road a.k.a. “the Scottish Route 66” and the following North Coast 500 campsites are not to be missed. 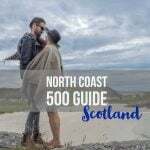 This guide will include official campsites, options for camper vans on the North Coast 500 and wild camping possibilities. Coming to Scotland? 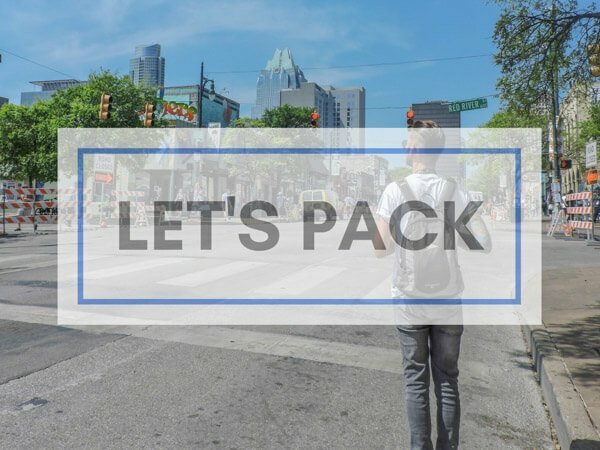 Click here for our travel guide – we’re locals! 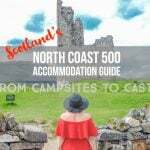 Why camp along the North Coast 500? Besides the tropical-like scenery, you’ll be able to enjoy the grandeur of the Highlands with its emerald hills and lochs (lakes), while driving along this road. What more could nature/adventure enthusiasts ask for? As hotels, hostels and b&bs book out fast on the NC500, camping is the ideal form of accommodation for those who are booking in a hurry. 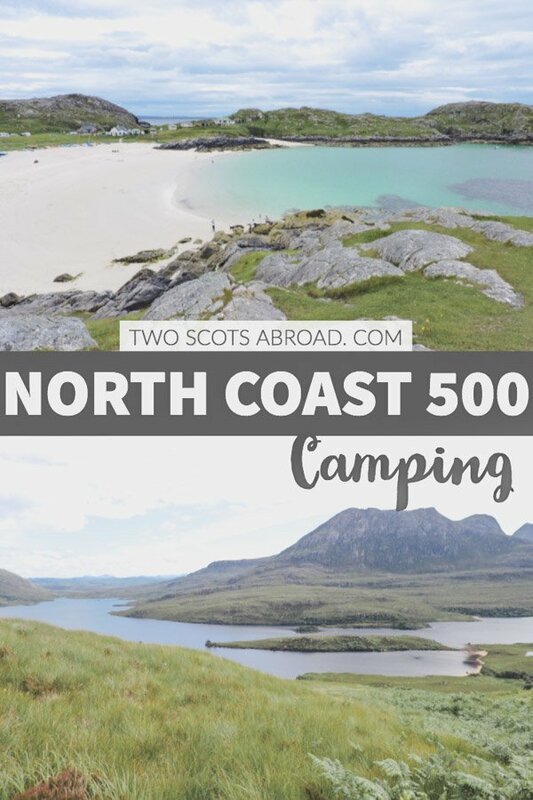 Plus, North Coast 500 camping is economical, for the most budget-friendly option adhere to Scotland’s wild camping rules (see below) and set up anywhere! As I’ve already mentioned, the North Coast of Scotland boasts a variety of different landscapes. This region is unique in every sense of the word, and it is extremely gorgeous, so that’s why you need to see it for yourself. Now, camping allows us to get close and personal with nature, in a way that we rarely experience nowadays. I’m sure that an adventure through this region will leave you with a wide smile on your face and asking for more. Another great thing is that Scotland’s law allows wild camping in most areas as long as you follow the Scottish Outdoor Access Code. Where to camp, where to camp? A great dilemma as there are so many fantastic NC500 campsites. The truth is, there is no right or wrong way to do the increasingly popular NC500 camping trip and whatever works for you is all that matters. In this section, I am going to focus on both campsites and beaches but I find beaches to be the most pleasant spots for sleeping. 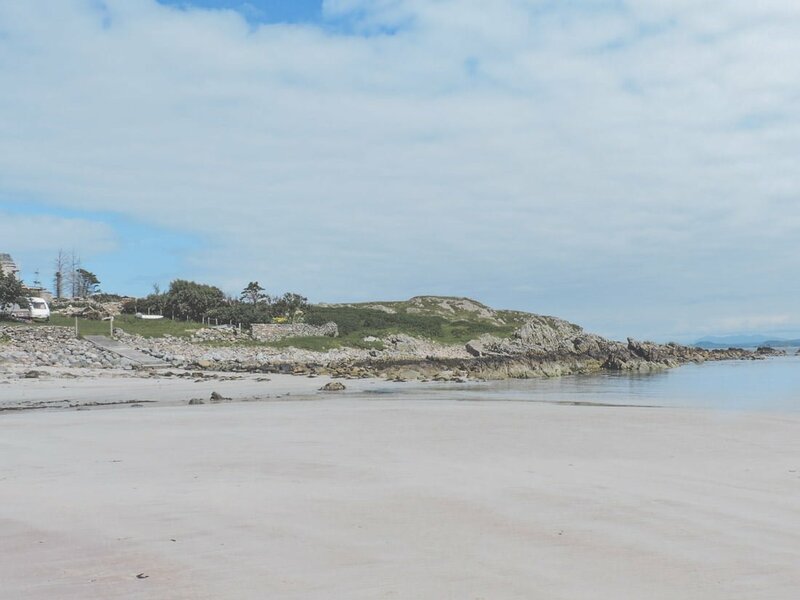 For other trips, I would normally recommend these beach tents, however, for this Scottish tour, you will need something that offers more protection from the elements. 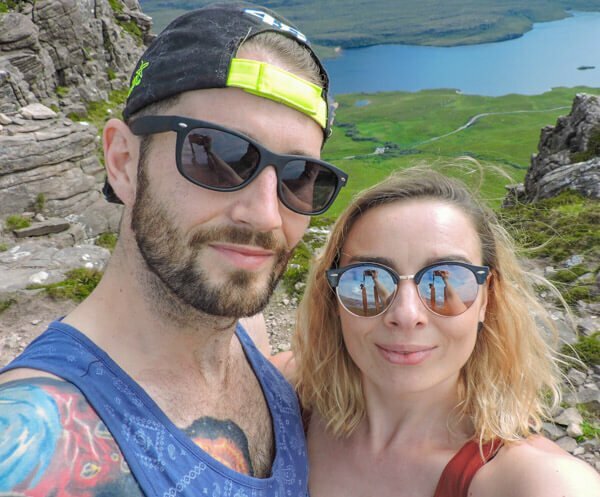 Down to its views, exceptional beautiful views and proximity to the freshly cooked fish served at the Applecross Inn (1o minute walk), Applecross is one of Scotland’s most famous camping spots. 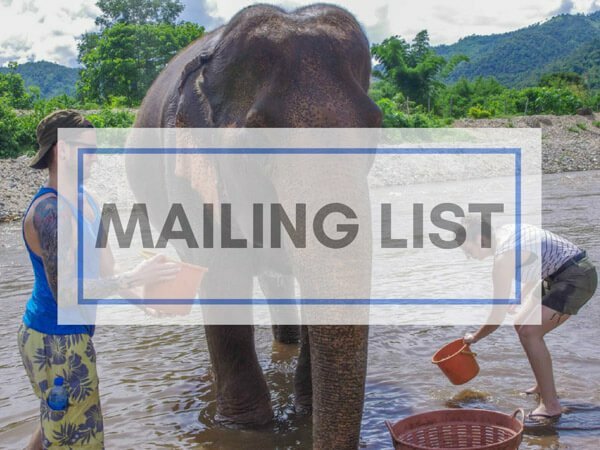 The site offers large tent areas, free hot showers and toilets, shaver points, dish washing facilities and free WiFi around the reception area. Applecross also caters for campervans and motorhomes via ten serviced hard standing pitches and 9 electric grass pitches. Applecross used to be popular now, it is off the chart in demand so book using their online system. Mellon Udrigle Beach really is one of Scotland’s special spots. This is one of the first turquoise seas beaches you will come across while touring the NC500. It’s a quiet beach with a £10 daily charge for campervans. Free water and chemical disposal available but no public toilets. A good spot for beach camping in Scotland. This award-winning beach sits next to the family-friendly Shore Caravan Site which offers no-set pitches but aims to not turn anyone away. They have an overrun campsite close to the caravan site. Facilities include toilet block with showers, launderette, on-site shop, on-site chip shop and WiFi. Bonfires are allowed (not on the grass). Shore Caravan Site is open end of March to mid-October. Prices range from £7-£16. This sea loch is located in the northwest, between the villages of Durness and Scourie, roughly. An interesting thing that you can see here is a traditional Scottish boathouse. This location also has parking so your car will be safe and sound, as you pitch up and relax while looking at the mountainous landscape. At the top of the NC500 route lies the town of Durness. Durness is home to Smoo Cave and Sango Sands campsite. You really feel like you are at the end of the world staying at this campsite on the North West. Sango Sands is open from April to the end of October and offers 58 electric hooks up points (hard standing and on the grass). If you don’t require electricity, there is usually enough room to rock up on the day. Facilities include toilets, shower block, kitchen, waste disposal, dishwashing, laundry facilities and a restaurant with a bar. Furry friends are welcome at this pet-friendly campsite. Like many of the North West Scotland’s campsites, there is a lack of shelter so it can get windy up there. To reach Ceannabeinne Beach, you should take the A838 road east of Durness. It is located in a small bay that faces north towards Eilean Hoan island. There are plenty of beaches that resemble Ceannabeinne, but this one offers parking as well as excellent pitching ground. Oh yeah, the views aren’t too shabby either. As you reach the John o’ Groats tourist info centre, stop by to grab a map of the area, and on it, you’ll see a clearly marked Sandy Bay. It is a 10-minute drive away from the centre, and when you get there, you will see an off-road, grass parking. After a short walk through the hills, you’ll probably spot some campers which means you arrived at the spot. If you have extended time and want to explore one of Scotland islands, take a detour to the Isle of Skye. Torvaig Caravan and Campsite is not exactly wild camping but thought it would be a good idea to spend a night at a more comfortable location. You can find electricity and running water here, as well as WiFi and washing machines. The price for one adult and a tent is £9. The grey area with NC500 wild camping is that the main way to get around the route is by car and wild camping in other areas of Scotland is often utilised by those on foot (see our West Highland Way guide for more details on Scotland’s West Coast hike). As you are not supposed to wild camp near roads you will need to leave your car as you hike to your camping spot. The beaches are perfect spots for this. That being said, these rules are in place to protect you, locals and the environment and not infringe on your rights to explore the Highlands so be smart but have fun. Don’t forget to bring a lot of money for petrol/gas and food/water! In case you didn’t know, the weather in this region is unpredictable, and some would say that you can experience multiple seasons in one day. However, when it comes to camping, there are some months that are obviously preferable to others. Late spring to late summer is the best time to go here. While May and June are the driest months of the year, July and August are the sunniest. The daylight lasts for about 18 hours a day during the summer, which gives you a lot of sunlight to enjoy the scenery. Camping not your cup of tea? Hiring a campervan for the NC500 is very common and is a relatively easy way to get around. Obviously, you do have the winding roads of the Bealach na Bà to content with (close to Applecross on the West Coast) and Scotland’s ‘A roads’ (single roads) make driving on the other side a slight challenge but fellow drivers are courteous if you are too. There are plenty of ‘passing places’ for you to pull over in to let other drivers past. Other benefits of taking North Coast 500 motorhomes trip is that you have flexibility with your itinerary (accommodation like hotels book up really quickly) and a bit of luxury! North Coast 500 caravan sites tend to run alongside the camping sites mentioned in this article. The facilities available at each have been mentioned above. To save money you can always create your own stops, nip into the supermarkets (there are a few on the road at Inverness and Ullapool, eating out can get expensive) and pack a filter bottle, Scotland’s drinking water is very nice. So that would be all that I’ve got for you today. 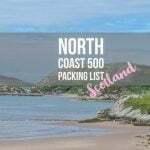 My NC500 camping guide has reached the end, but I hope that reading this will mark the beginning of your journey. In case camping is not your thing, I’d still recommend you to check out this road and all it has to offer, as you can find plenty of decent accommodation here too. If all this sounds interesting to you, read on and find out more about the North Coast road, as I’ve only covered the very basic information in this article. So, until next time, stay adventurous and live life to the fullest! Melanie is an outdoor and camping enthusiast behind Ardent Footsteps, enjoying this wonderful world since 2010. She shares expert advice when it comes to camping and outdoor trekking. 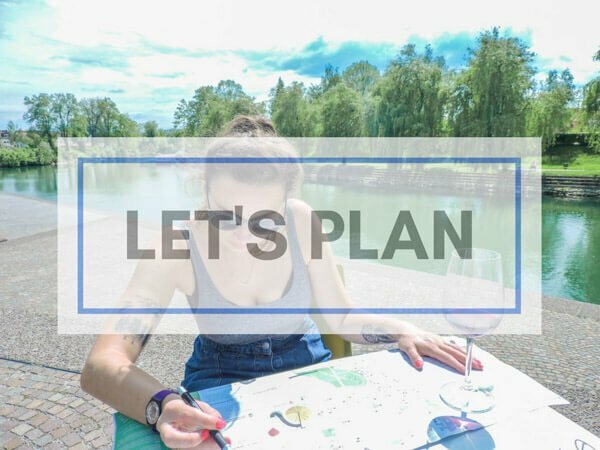 With the main focus on making the most out of camping and outdoor adventures, Melanie will make you want to go out today! 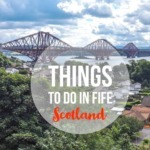 This is what we got up to next – 70 things to do in Edinburgh! 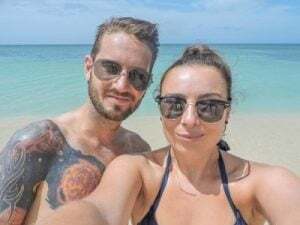 I had no idea those tropical looking waters existed in Scotland Gemma! Wow…..amazing. Neat too to know Scotland has a Route 66 type, drop dead scenic route. I became more of a road trip guy here in New Zealand. We have no choice. Either road trip it or pay through the teeth for group tours LOL. I love the flexibility it gives us too. Although sometimes a group tour is on the cards during long-term travel so we don’t kill each other! Image 3? 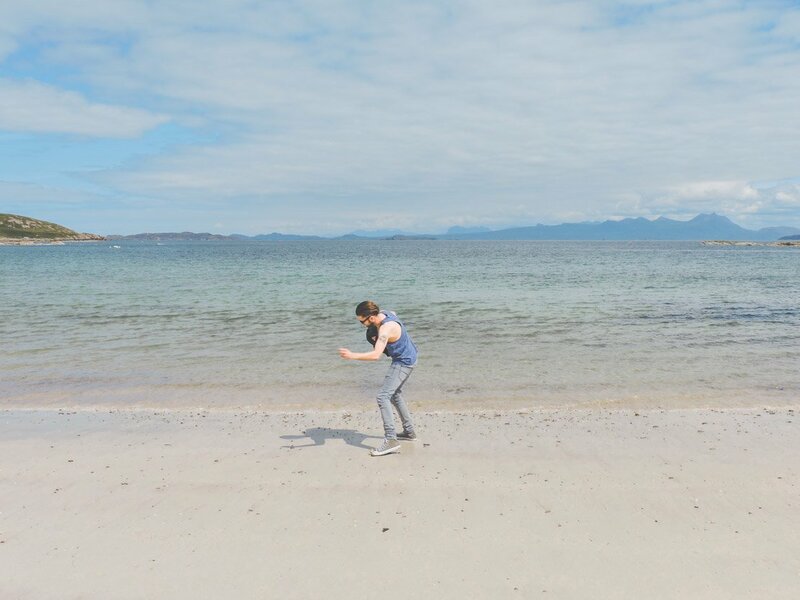 I filmed Craig along this beach and I am pretty sure it was Mellon Udrigle? Here’s the video: https://www.facebook.com/twoscotsabroad/videos/1432498473453384/ [end for strut on beach]. “3. Alchmelville Bay” is Achmelvich. Do you happen to know why you’re not allowed to camp next to your car? Oh thanks, James, sorry about that! I don’t know the theory behind it. I’m guessing it could be because roads might be next to buildings when I think of where people try to wild camp around Scotland. It might a safety factor too? This is a really useful article. Myself, hubby and dog are planning a road trip around the NC500 area in June. We will probably have a total of 5 days in Scotland, maybe 6 and would like to maximise (within reason) where we go and what to see. Hi Kristina, we were in Harris and Lewis in November but only had two days. I would have really liked a third day. You’ll spend a day driving to Ullapool (watch your ferry times) and a day back so that’s your five days up. Well worth it though. Harris is spectacular. You can read about our trip here. Hiya. Really enjoyed your article. Been thinking of doing the 500 for the last 18months. Cant decide on motorhome,or tent! So i think ill take both. Keep my options open. Safe journey to u all! I’m just back from a campervan trip in Texas. Loved it! Come back and let me know how you get on please.